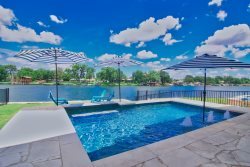 Are you looking for a fresh water Texas fishing location with breathtaking views and no boat traffic? We recommend fishing the Lake LBJ Colorado Arm shoreline for large mouth bass and crappie, just below Inks Dam. White Bass Fishing Spring 2013 - Upper Colorado Arm on Lake LBJ, along the Inks Lake Dam National Fish Hatchery.